What if your darkest nightmares started to feel more like memories? If your violent dreams left you beaten and bruised in the morning. Could you trust a wife that avoids questions about your past when you can’t fill in the gaps yourself? Does everyone struggle to remember their youth or is there something darker hidden in your past? These are the questions that haunt Ben all the time but one day, when he sees on the news that the woman from one of his violent dreams has been found murdered, something in him gives. In a heated argument with his wife Carrie, she suddenly cries out ‘help me, he knows.’ At that moment, his wildest fears are confirmed and moments later he is dragged from his home by complete strangers. Toby suffers from similar dreams but instead of hurting other people in his nightmares, it’s always his own body that ends up broken and bruised. At fifteen, he’s already covered in inexplicable scars and wounds but when he tries to talk to his parents about his fears they use his troubles at school to treat him as a bully victim and avoid the deeper issues. When one of Toby’s teachers starts to realise something serious is going on, they all start to unveil a secret they were never meant to discover. I found the very first chapter of this novel a tiny bit disconcerting as it is written in quite a basic, slang style, which gave me the very wrong impression that this was going to be quite a basic crime book. I really hope no one else is put off by the style in the first few pages as once it became clear this was only used for Ben, a down to earth, simple family man, I became utterly hooked. As the story unfolds you really can’t begin to guess where it is heading or who the characters can trust, making it hard to put down. 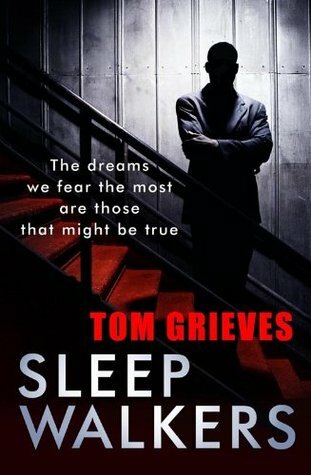 Tom Grieves has previously been a scriptwriter for The Bill and Being Humans as well as a number of other shows and I think this comes across in this novel with excellent imagery and rounded characters. If you enjoy a smart, unpredictable thriller, you’ll love this!